As we gear up for the long Memorial Day weekend, I ponder the many wonderful picnic-friendly vegan recipes I have planned: BBQ tofu, pesto pasta, tahini coleslaw, black bean dip, guacamole, and today’s featured dish: Not-Chicken Salad. I love when I get excited about a stay-cation because of food! 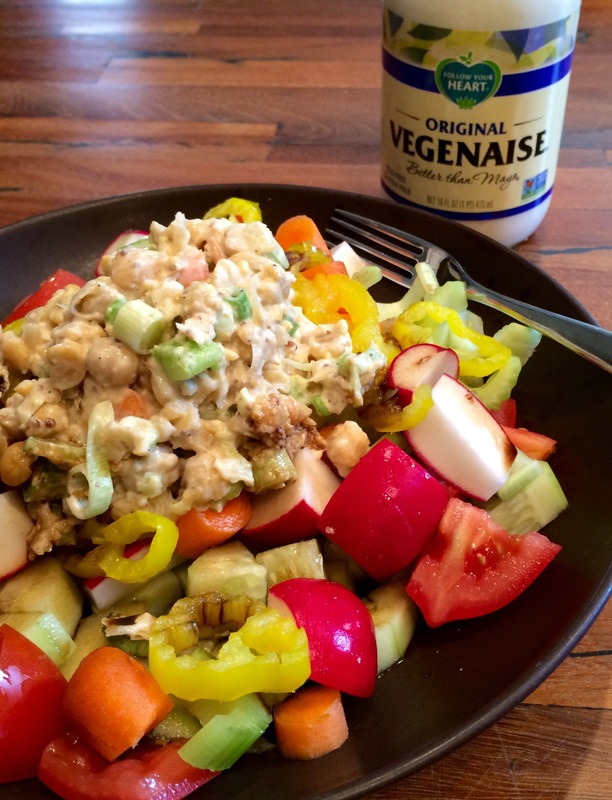 Vegenaise is soy-based vegan mayo that tastes uncannily like regular mayonnaise and has just as much fat and calories, so you know it’s going to be creamy and delicious! This recipe uses all the familiar ingredients of a potato salad, but mashed chickpeas replace the chicken for a heartier, low-glycemic protein bite. This was recently taste-tested by the non-vegetarians in my life and they couldn’t believe it was vegan! This one’s a serious winner for the summer, and tastes great as a dip, salad-topper, or sandwich stuffer. Drain and rinse your chickpeas, place in medium size bowl, and roughly mash with a fork or potato masher. Add the remaining ingredients and combine. Store leftovers in an air-tight container in the fridge for up to a week!